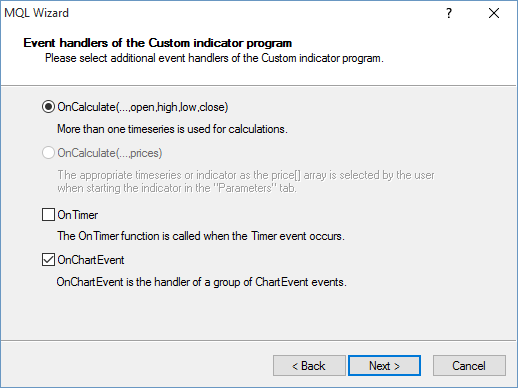 First you need to start a new indicator project and make sure you include the OnChartEvent function by selecting the appropriate radio button during the setup wizard. 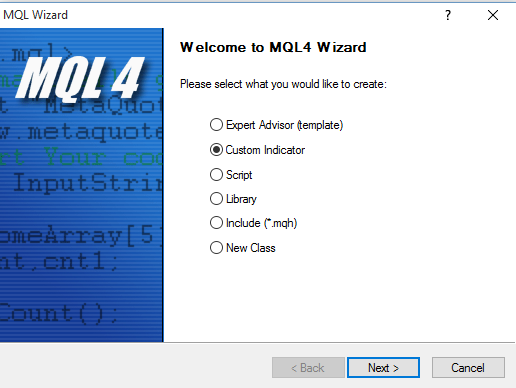 In MetaEditor choose File->New and follow the prompts by the setup wizard. You can name it anything you want but as you'll see below; I named it something really exciting like 'Toggle_Example'; imaginative I know! Don't forget to select the 'OnChartEvent' radio button too. Then you need to add an external variable to hold the value that we are going to be toggling. This is only for demonstration purposes so the indicator won't have much functionality but you will understand how to code a button for your own projects. #property copyright "Copyright 2015, Automated Trading Software"
We also need to give our button a unique name so that we can refer to it throughout our code. Again I let my creative juices run wild and came up with the amazing variable name of 'sButtonName' and set it's value to 'toggle_button'. If you've downloaded the code provided below and are following along, scroll down to our 'Toggle' function. I won't go into too much detail about what it does as it should be obvious just by looking at the code. The only thing that's interesting to note is the use of '!value_to_toggle' which is being assigned to itself. By assigning the negative of the value we are actually assigning the opposite value. So basically if the value is true then it's negative will be false and vice-versa. It's just a shorthand way of toggling or flipping a boolean value. Below our 'Toggle' function you can see the 'CreateButton' function which is pretty standard. It just accepts whichever parameters we've decided to allow the user to change and then sets up the object. To actually allow our user to interact with the button object we just need to add one line of code to the 'OnChartEvent' function. This function is fired every time there is an event on the chart and we are able to intercept it and see what it is. In this case we're only interested in trapping events from our button so we check the 'sparam' parameter and see if it matches the name of our button. When you place the indicator on a chart you should see an arrow in the top-right corner and a comment in the top-left. Try clicking on the arrow and watch what happens to the comment. You should see the value of the 'value_to_toggle' variable change between true and false on each click. That's all there is to it and you can now add toggle buttons to any indicator or expert advisor that you wish. 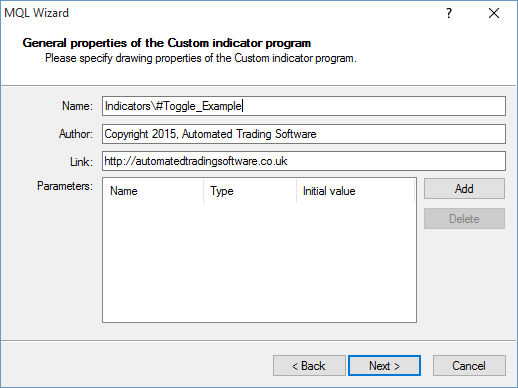 You'll need to decide how the variable you've toggled is used in your indicator or EA and may have to add some more code in the 'Toggle' function to accommodate it. In my case I had to add a line of code that would force the indicator to redraw itself so that the new value would be reflected. Exactly how you do that will be dependent on your particular situation and is beyond the scope of this article. Another thing to notice in the code is that I decided to use an arrow as the button. I didn't like the way the standard button looked and felt it was too much for my particular situation. If you decide to use a text button just make sure to change the type of the text variable in the 'Toggle' function to string rather than uchar as it is in my example. Well I hope that's helped a little and have fun coding your projects. 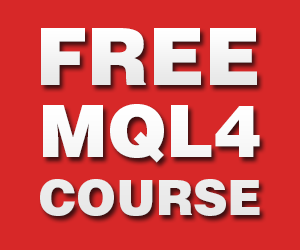 Download the complete indicator with MQL4 source here. Don't forget that if you ever get confused whilst coding your own indicators or Expert Advisors in MQL4 you can just place your cursor on any function name, click to select and then hit 'F1'. That will pull up the help file and take you directly to the section that gives more information about the function you were interested in. This trick only works for built-in functions that MetaEditor is aware of and won't work on custom functions that you write yourself.